Jaundice - body, causes, What Are Bilirubin and Bile? Jaundice (JAWN-dis) is a yellowish discoloration of the skin and of the whites of the eyes. It is caused by accumulation in the body of a bile pigment called bilirubin (bil-e-ROO-bin). Jaundice is not itself a disease, but it is a sign of several disorders that affect the liver, the blood, the gallbladder, or bile, which is a fluid secreted by the liver to aid in the digestion of fats. The medical term for jaundice is icterus (IK-ter-us). What Are Bilirubin and Bile? When a person is in good health, the bile pigment * bilirubin is formed from the normal breakdown of hemoglobin (HE-mo-globin), which is the oxygen-carrying substance in red blood cells. This process occurs naturally as old red blood cells wear out and are replaced in the body. Bilirubin is then carried in the bloodstream to the liver, where it is combined with bile. Bile, which is also called gall, gets its greenish-yellow color from bili-rubin. Bile is a fluid secreted by the liver to aid in the digestion of dietary fat. Bile is stored in the gallbladder. When it is needed for digestion, the gallbladder pushes it out into the small intestine through a tube called a bile duct. Much of the dark color of stool is the result of bile pigments. * pigment is a substance that imparts color to another substance. There are different kinds of jaundice, but they all occur when the process described above is disrupted and causes buildup of too much bilirubin in the blood. Anatomy of the liver. 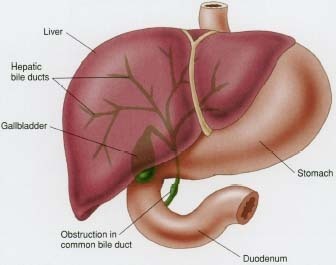 An obstruction in the bile duct may lead to jaundice. Hemolytic * jaundice occurs when the rapid breakdown of too many red blood cells results in the overproduction of bilirubin. This may occur in such diseases as malaria, sickle-cell anemia, and septicemia (sep-ti-SEE-me-a), or blood poisoning. Hepatocelluar * (liver) jaundice occurs when damage to the liver lessens its ability to remove bilirubin from the blood. Hepatocellular jaundice commonly occurs in hepatitis, cirrhosis of the liver, and liver cancer. Swallowing or inhaling poisonous chemicals and advanced alcoholism can also produce jaundice from liver damage. This is a common form of jaundice. Obstructive jaundice occurs when the bile duct from the gallbladder to the small intestine narrows or becomes blocked, causing bilirubin to back up and accumulate in the blood. Obstructive jaundice may result from gall-stones, injuries, tumors, or inflammation that affects the bile ducts. Physiologic * jaundice sometimes occurs when newborn babies have too much bilirubin in the blood. This form of jaundice usually disappears within a few days as the infant's liver matures in its ability to handle bilirubin. * hemolytic (he-mo-LIT-ik) refers to destruction of red blood cells with the release of hemoglobin into the bloodstream. * hepatocellular (hep-a-to-SEL-u-lar) refers to the cells of the liver. * physiologic (fiz-ee-o-LOJ-ik) refers to an organism's healthy and normal functioning. Jaundice is not itself a disease, but it is a sign of several disorders that affect the liver, the blood, the gallbladder, or bile. Other signs and symptoms of disease may occur along with jaundice. For example, the urine may be dark brown owing to the excretion of bilirubin, or the stool may be nearly white owing to lack of bilirubin, which produces the normal brown color. Blockage of the bile ducts may also cause intense itching as bile products accumulate in the skin. In hepatitis and other liver diseases, jaundice may be only one among many signs and symptoms. How Is Jaundice Diagnosed and Treated? Anyone whose skin becomes abnormally yellow needs to see a doctor to find out why. Part of making the diagnosis may include special blood tests to determine whether the liver is diseased or whether too many red blood cells are being destroyed. A urine sample may be taken to test for bilirubin. A liver biopsy, in which a tiny tissue sample is removed for analysis, may be performed. Ultrasound scanning, which uses sound waves to look inside the body, may be used if the doctor is looking for gallstones or other causes of obstruction. After the doctor completes the diagnostic testing, an appropriate treatment plan is chosen according to the disorder identified as the cause of the jaundice. The words "bile," "gall," and "jaundice" have all been associated with negative emotions: bile with anger, gall with insolence and audacity, and jaundice with distaste or hostility, as when one views someone or something with "a jaundiced eye." These usages all derive from medieval medicine, when it was believed that different states of the body and mind were caused by "humors," or body fluids, one of which was bile. Bile is quite bitter-tasting. Thus, the term "good humored" came to mean having a pleasant disposition, while "ill humored" came to mean surly or irritable. The website of the U.S. National Institutes of Health has a search engine that locates information about diseases that cause jaundice. American Liver Foundation, 75 Maiden Lane, Suite 603, New York, NY 10038. This website addresses frequently asked questions about liver disease and jaundice.